On the 13 February 2012 the exhibition 'Ranks, a Limerick Industry' was launched in the Hunt Museum and ran until 31 May. This exhibition was years in the making ever since the diaries of the Ranks mill manager Cecil Mercier was donated to the Limerick Archives. 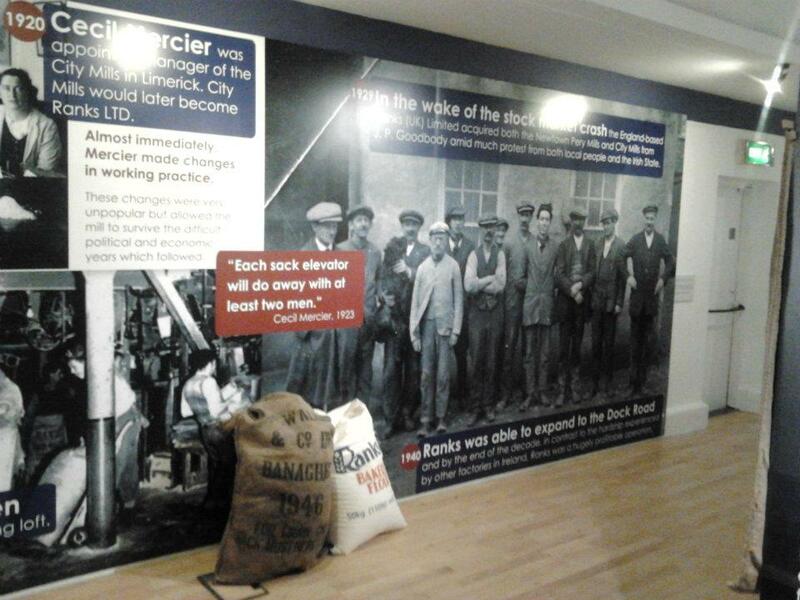 I was lucky enough to be involved in the five month build up to the event assisting Limerick Archivist Jacqui Hayes in devising, planning and promoting this exhibition highlighting an extremely important chapter in Limerick's industrial history. Not only that it represents a time when the city could boast of having dozens of bakeries and every household bakes fresh bread every day hence the demand for flour. The grain silos themselves have become an important Modernism landmark along Limerick's docks. Jacqui worked closely with the Hunt Museum's Education & Outreach curator Dr Dominique Bouchard in the design of the interpretive panels and the layout of the exhibition space. I had gotten the role of Exhibition Assistant through a JobBridge Scheme. Despite its bad press I think found my placement a thoroughly worthwhile experience and a fantastic addition to my CV. My role covered a multitude of tasks such as helping to can the donated photographs to contacting Rank Hovis McDougall to request permission to use the iconic wheat sheaf 'R' in the exhibition and on the cover of the publication. The most challenging aspect to the job was sourcing all the objects (with no budget might I add for renting or purchasing objects) for the exhibition to be displayed alongside the diaries, letters and documents from the Mercier Collection. This was not an easy task. The photo to the right shows the wall that the visitor was met with. The background image demonstrated the dominating visual presence the four silos had in the city. For those approaching Limerick by boat via Foynes this was their first impression of the city. A modern industrial city. The sign on the right hand side of the wall was the original sign at the entrance to the Ranks site. The construction of Ranks began in 1931 with the company establishing their Irish headquarters in Limerick. Due to changes in the Irish economy and manufacturing practices Ranks closed in 1983. Only one silo stands today after the others were demolished in 1989. The high nelly was the most common mode of transport for the hundreds of workers with one former employee commenting that the Dock Road in the morning was like Beijing with all the Ranks cyclists. We also got our hands on a metal lunch pail that some staff would've carried on their handlebars. A bicycle was a huge investment at the time. One former employee still had her book which showed her bicycle payments to one of the city's bicycle shops. 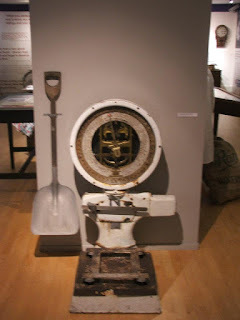 The image below shows the first panel and an original grain sack and a replicate flour sack. My maternal grandmother as a child, like many working class people in Limerick city, slept underneath Ranks sacks. Mothers would often bleach the sacks in an attempt to fade the identifiable blue lettering. Andrew Gallivan who was an intern at the time with the Hunt Museum made the film to accompany the exhibition with Dr Bouchard. 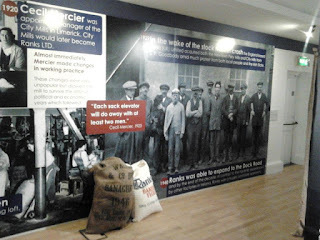 The printing of the panels and replica flour sacks was done by Limerick-based ScreenGrafix. It featured former workers recounting their time in the mills. 'Ranks or the banks' was the saying in Limerick as a job in their various departments was seen as a job for life. The exhibition was a huge success with the visitor book recording congratulatory comments from people as far away as Canada, Australia, South America and Japan. It was awarded Best Exhibition' by the Industrial Heritage Association of Ireland (IHAI) at their AGM in February 2013. 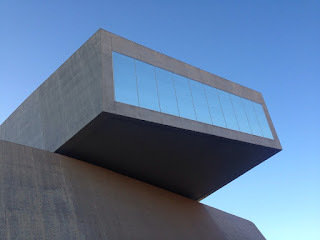 I am delighted to see that the exhibition will get a second showing as people still ask me where can they see it and they regretfully missed it first time round. 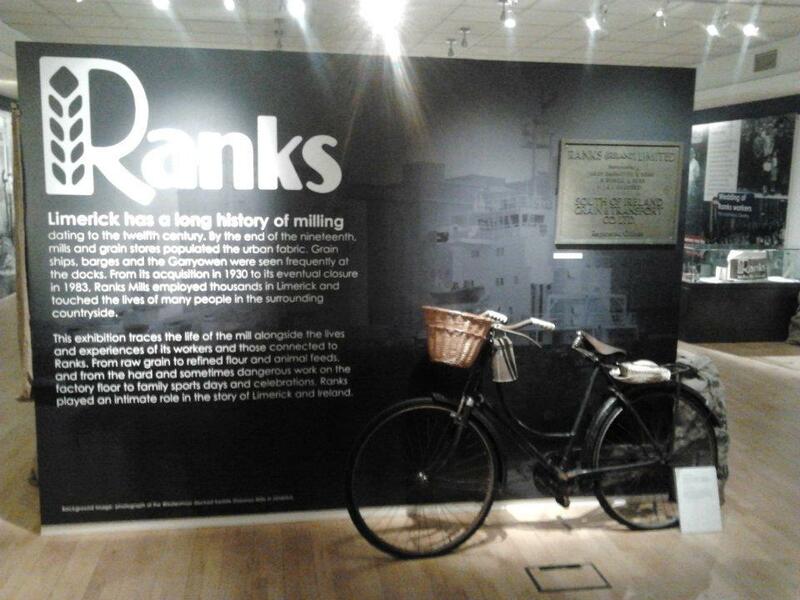 The Limerick Museum & Archives invites Limerick to the launch of 'Ranks: A Limerick Industry' on Thursday 24 September at 6pm in the Hunt Museum. Best of luck to Jacqui and her team and I look forward to seeing this wonderful exhibition again. One of my favourite objects from the exhibition is these weighing scales. One of the photographs in the Mercier collection was of the workers lifting the flour sacks onto an industrial weighing scale. I had remembered spotting this one during a conservation job the previous year for my father's practice in a former co-operative creamery in Glin, Co. Limerick. I had discovered it at the back of one of the out buildings. Admittedly it was for weighing butter but it looks so similar to the one in the photograph, I contacted the owner of the former creamery and he had no problem with us borrowing it for the duration of the exhibition. Every time I look at it's handsome golden face I am reminded of my first encounter with Limerick Conservation Officer Tom Cassidy. We are now very good friends but during that site meeting we were both very formal!